The Sick Children's Hospital was opened on 20 December, 1882, after a private villa (owned by David Anderson) was converted for the purpose. 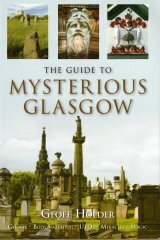 The first proposal for the hospital was made as early as 1861, by which time it was recognised as a disgrace that a city with as large a population as Glasgow's did not have a hospital dedicated specifically to the care of sick and injured children, and the training of nurses to care for them. After much campaigning and fund raising, the building was purchased in 1880 for �2,000, and the Glasgow architect James Sellars , of Campbell Douglas & Sellars, was appointed to design the hospital for a total cost of �12,510. The hospital's first patient was a five year old boy with curviture of the spine, who was admitted on 8 January 1883. Amongst the alterations to the building was the addition of carved panels above its main entrance on Scott Street. Carved in blond sandstone, these comprise a rectangular section with a roundel of a half-length woman holding a child in her arms, representing Charity, which is flanked by two panels filled with pairs of playful Amorini. Below them, filling the spandrels above the door, are trees carved in relief, which are seperated by a keystone carved with acanthus leaves. Although the identity of the sculptor of the reliefs remains unconfirmed, there is a possibility that they were modelled by one of the Mossmans and carved by C B Grassby , who collaborated on stylistically similar work above the entrance to Sellars' earlier Glasgow Herald Building at 63-9 Buchanan Street (1879-80). A copy of the Charity roundel was executed for the hospital's dispensary at 9-13 West Graham Street in 1884, with Sellars again as the architect, and the relief carved in red sandstone possibly by the same sculptors. The Sick Children's Hospital was eventually superceded by a much larger, purpose built hospital at Yorkhill in 1914, and replaced again by the present, modern building.